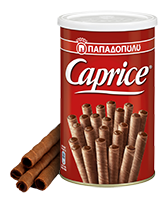 Papadopoulos Greek Caprice Wafers! The best praline cream filled wafers you’ve ever tasted! Crispy wafers with cocoa and hazelnut filling that melts in the mouth and awakens the senses. One is never enough with this unique irresistible recipe… A perfect choice for you and your friends, as a daily indulgence but also on more special occasions. In two delicious flavors: Caprice with hazelnut and cocoa cream and Caprice with dark chocolate cream filling. A brand with a history, a recipe that has been adored like no other, a sweet addiction!